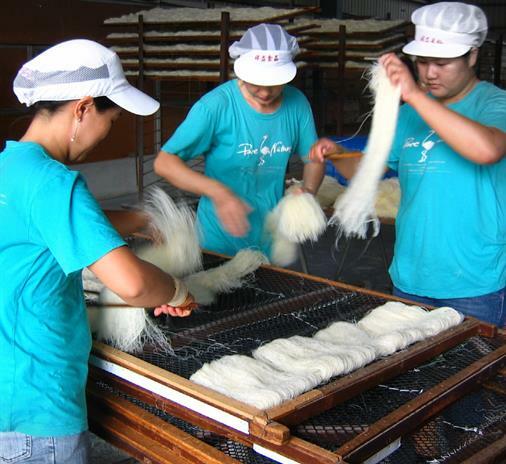 Xiangyi Rice Noodles was founded by Ming-Sing Lin and his spouse Ciou-Sia Lee in 1982, and is famous for its supreme manufacturing technique and the strict quality control. The products are mainly exported to Japan. Mrs. Lee, with the guidance from Rice Production and Marketing Group, Farmer’s Association of Kouhu Township, has been devoted to developing new products, and was awarded the Top 10 Outstanding Farm Housewives in Taiwan – The Outstanding Farmer Award in 1994. The products are also awarded with Quality Food Awards. In order to meet the needs from different consumers, Xiangyi Rice Noodles has also developed the instant rice noodles for convenient consumptions.